Do the complete ride alone in 70-minutes – or go at your own pace, hopping on and off as many times as you like at any one of their four convenient piers. 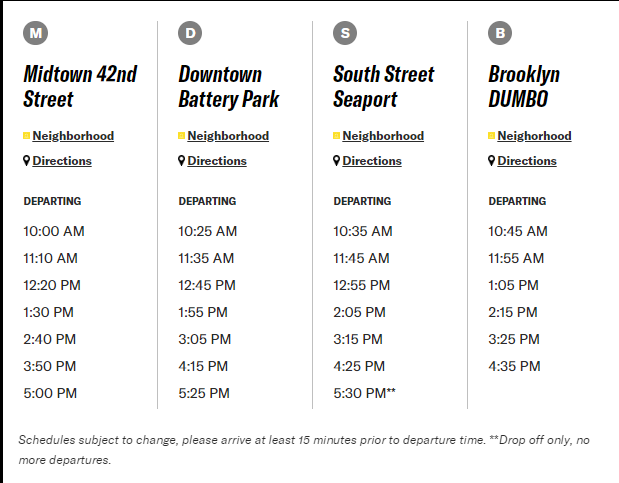 Starting times vary depending on location. Boats run every 70 minutes. Please check the schedule provided in the gallery for the most up-to-date schedule. You will receive an email confirmation with an attached voucher. All vouchers must be printed and turned in for an actual ticket at the box office. 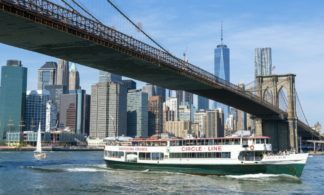 We recommend arriving at the pier 30-45 minutes prior to the cruise departure as their daily cruises are on a first come, first served basis. 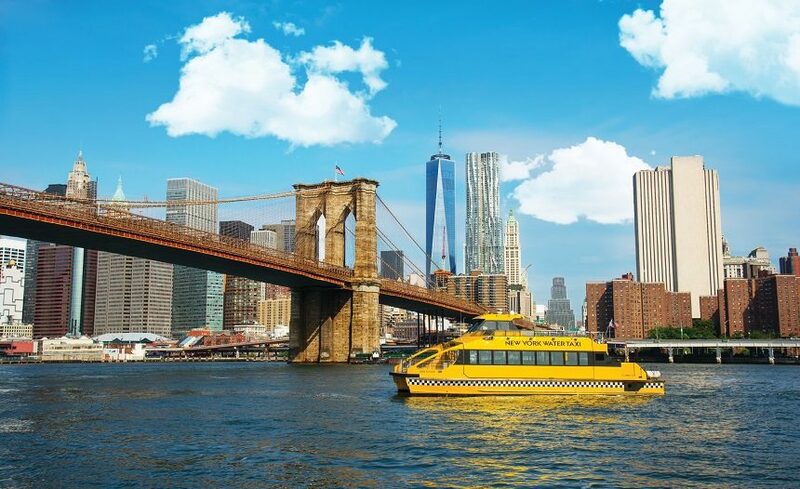 Experience the best of New York City with the New York Water Taxi All-Day Access Boat Pass – the ultimate adventure ferry! 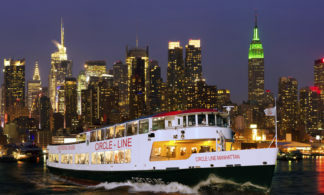 Onboard, you’ll marvel at breathtaking views of NYC’s world-famous skyline in its full glory. 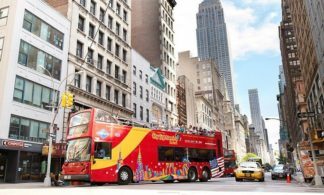 Along the ride, you’ll get close-up photo opportunities of the Statue of Liberty, Brooklyn Bridge, and other iconic landmarks. 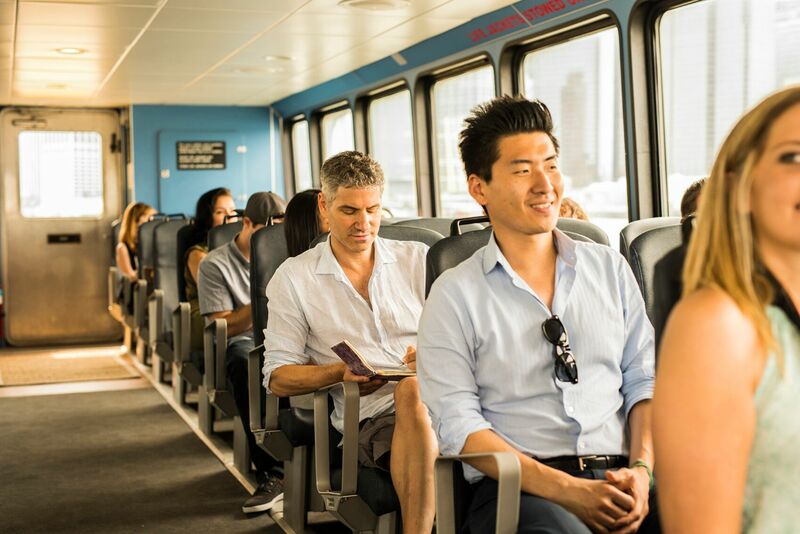 Customize your itinerary by doing the complete loop in 70-minutes, or go at your own pace – hopping on and off as many times as you like at one of the four convenient piers. 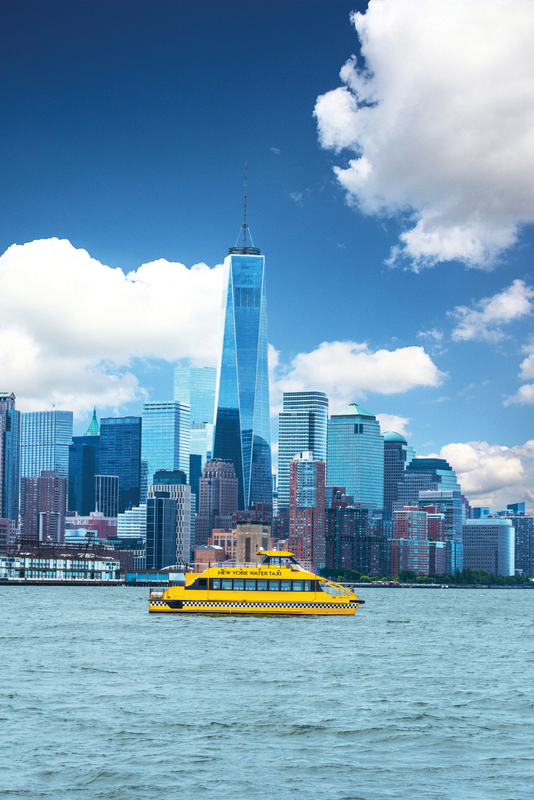 Famous sights, unique shops and the best of NYC’s legendary eats await you as you explore the bustling waterfront neighborhoods along the route. Happy exploring! 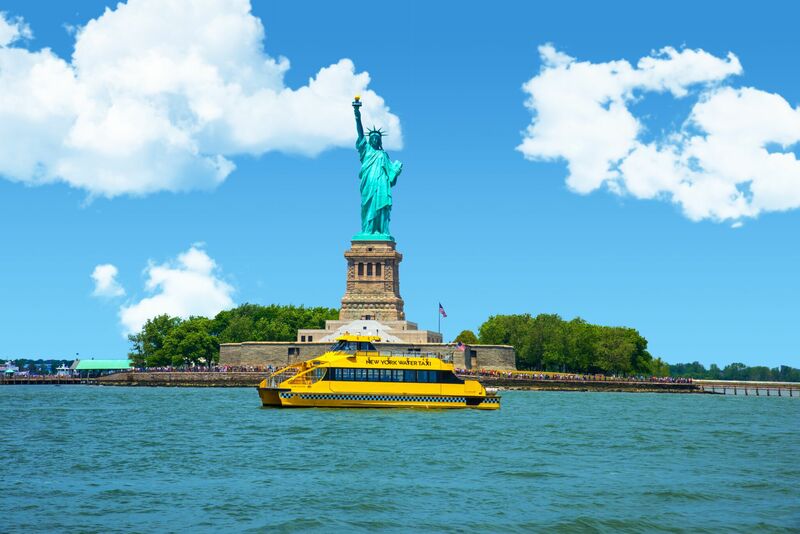 Get the best views of some of New York City’s most famous landmarks. Are the boats accessible to the handicapped? All of their boats are designed to be fully ADA Compliant. 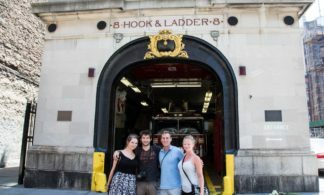 All of their piers and docks are accessible to the handicapped, except for Pier 83 (Midtown – W. 42nd Street). For additional safety reasons, wheelchairs do not have access to the top deck. Can I sit on the top deck? Yes! 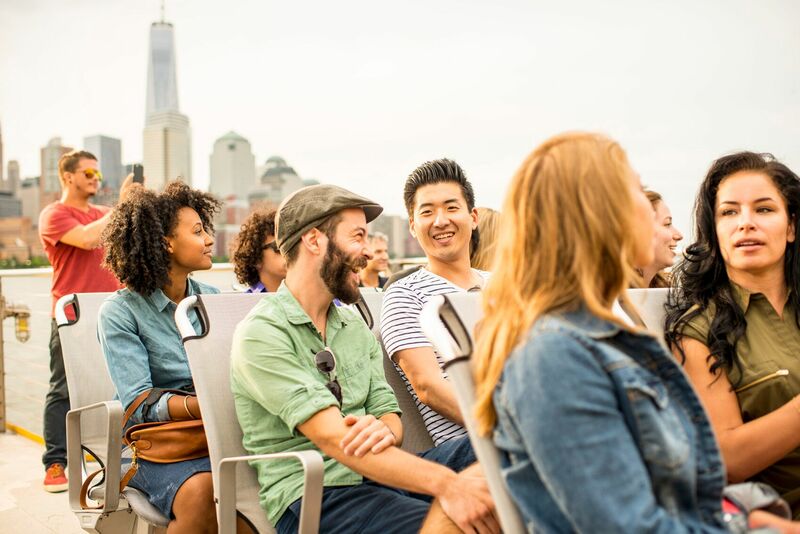 Our viewing decks are the best! 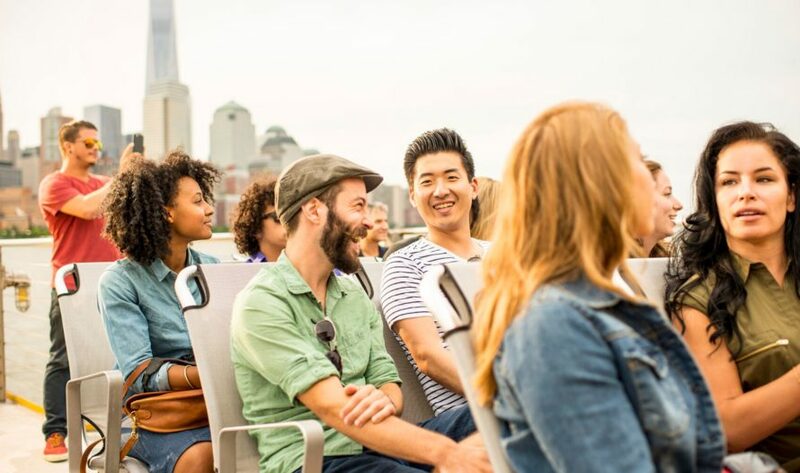 Our first-come/first-served decks offer 360-degree views that are unparalleled. Capacity is based on U.S. Coast Guard regulations. 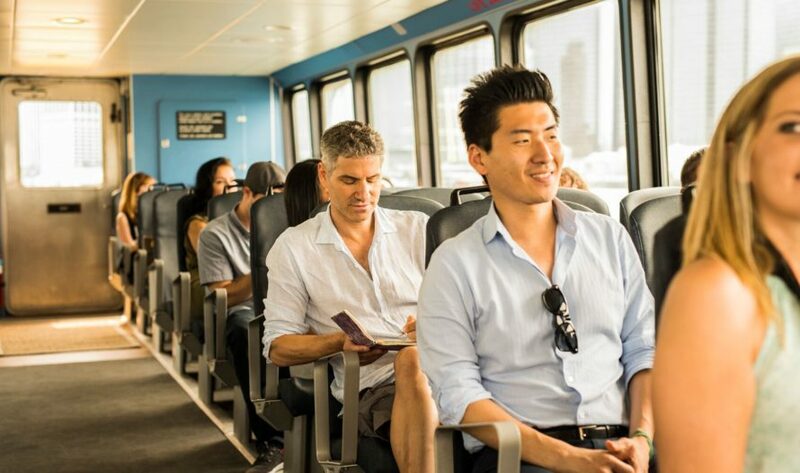 Can I bring a bike on the New York Water Taxi? Yes, if the space allows, you may bring your bike on board. What is the age limit for child tickets? For the All-Day Access Pass, child tickets are available for ages 3 – 12 and must be purchased in order to ride the boat. For children under the age of 3, please ask at the ticket booth for an infant ticket; it is free of charge. All children need a ticket. Unfortunately, we do not allow any outside food and beverage on any of the tours. Can I bring my pet(s) on board? Only “assisted life” and “seeing eye” dogs are allowed on board. No other animals are permitted. 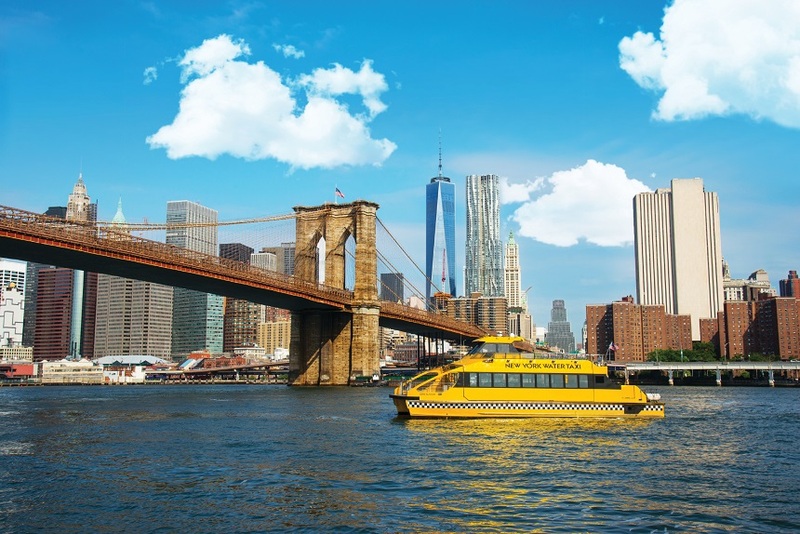 New York Water Taxi boats are smoke-free, so smoking is not permitted. Do boats sail in bad weather? 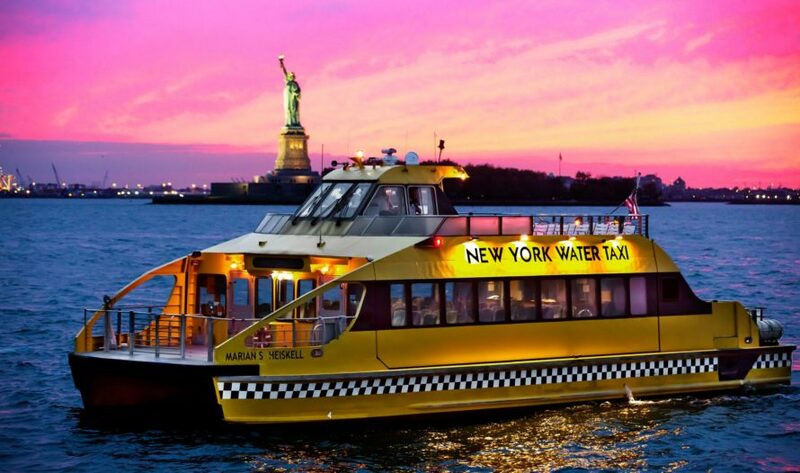 New York Water Taxi boats operate rain or shine. If the Captain determines that weather conditions make it unsafe to sail, the service may be terminated by the Captain at any time. 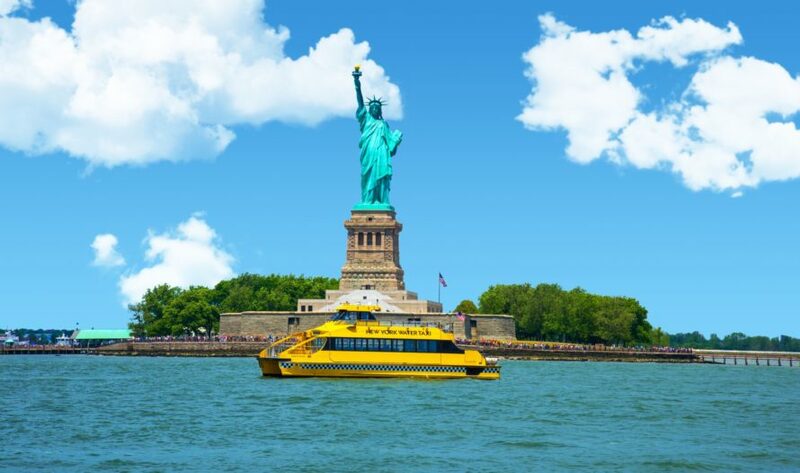 If you reserved a ticket for a boat that is cancelled, we will work with you to exchange your ticket for another cruise. Please call ahead if the weather is bad to find out about any service alerts for that day. Do they have a lost & found? 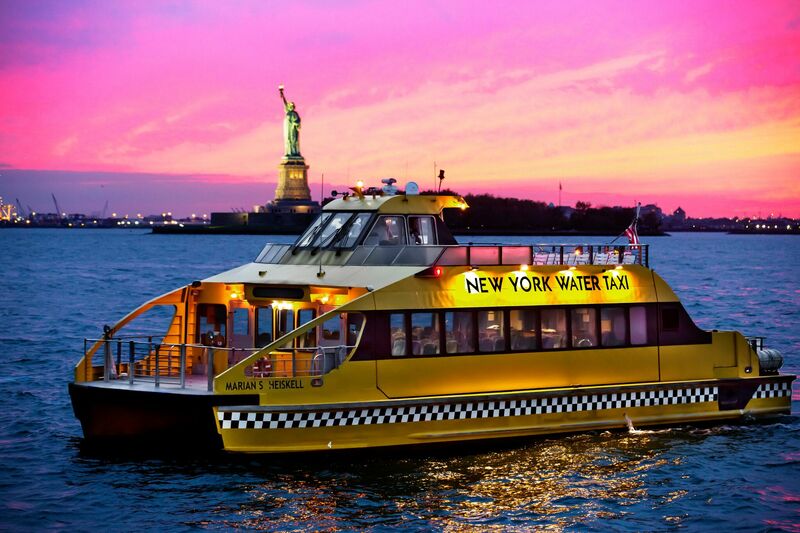 New York Water Taxi is not responsible for any stolen or lost items on our vessels. However, if you have misplaced any items, you may reach out to their team and they will happily check for you. 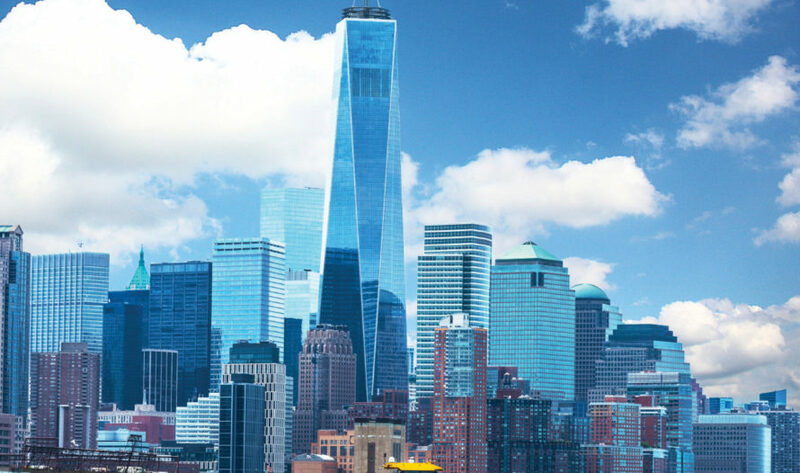 Please contact us at NYWTinfo@nycl.com.